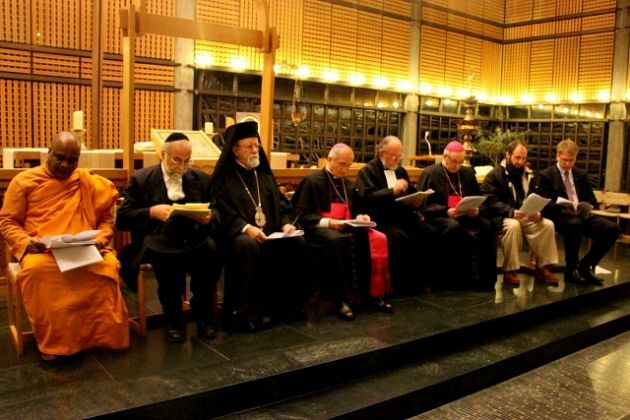 (Photo: Ecumenical News/Peter Kenny)Buddhist, Jewish, Christian and Islamic representatives attend an interreligious service to pray for peace in Geneva's Ecumenical Center, hosted by the Vatican's diplomatic representative to the United Nations, Monsignor Silvano Tomasi (center). Geneva – The Christian preached that peace is neither a dream, nor utopia, but possible, while the Muslim cleric stressed that extremism is a main obstacle to peace and has no place in Islamic teaching. Christians joined Buddhists, Jews and Muslims to pray for peace at a service in Geneva's Ecumenical Center, hosted by the Vatican's diplomatic representative to the United Nations, Monsignor Silvano Tomasi. The interreligious service for peace was held during The Week of Prayer for Christian Unity. Orthodox, Protestants and Roman Catholics in the northern hemisphere are celebrating the Week of Prayer for Christian Unity held this year between January 18-25. In the southern hemisphere, the event is observed during the feast of Pentecost. "On the world scene, on-going conflicts and threats of war disrupt and ruin the lives of millions of people: cities are destroyed, children are killed and maimed, women are raped and humiliated, camps overflow with refugees," said Tomasi . He was speaking in a packed service at the headquarters of the World Council of Churches and noted, "Sophisticated technology has produced new weapons of death, like drones, that dispense with a human presence and ethical responsibility. "Among the root causes of much violence that fills a good percentage of daily news reports, we find terrorism, piracy, aggressions for the control of mineral resources, fundamentalisms that disfigure the authentic face of religion." A Filipina choir from the Catholic Cathedral of Notre Dame enlivened the service, held for the second year at the Ecumenical Center, while African singers from the English congregation of John XXIII raised the roof with lively hymns and ululation. "Unregulated financial capitalism, the competition for power and the inordinate craving for profit, are also a fertile ground on which conflicts grow, where peace is sacrificed and human dignity seriously violated," said Tomasi in his sermon. WCC General Secretary, Rev. Olav Fykse Tveit, said the council "has proposed to turn our prayer into action and to embark on a pilgrimage for justice and peace that will address the financial crisis, grave social inequality and climate change also as threats to peace." Diplomats and dignitaries and ambassadors included the Director General of the World Trade Organization, Pascal Lamy. Imam Fabrice Tonnerieux from Geneva's Islamic Cultural Foundation said, extremism can be religious, political or some other form. "In most cases it induces its followers to commit acts that are unacceptable and ill-fated for humanity. "My community, the Muslim community, does not escape from this, in spite of the many warnings of the prophet Muhammad - peace and blessings upon him - on this subject. Like when he says: 'Beware of exaggeration in religion.' Or when he repeats three times: 'Those who exaggerate are heading for disaster.'" Among regrettable events linked to extremism in 2012 he cited "the heinous carnage that took place in the French city of Toulouse where the victims were children and innocent persons. And all this - according to the pretensions of the perpetrator - in the name of Islam." He called on Islamic leaders or ulemas to be peacemakers. Geneva's Chief Rabbi, Rav Izhak Dayan, said, "In Jewish prayers it is characteristic that the one for the reign of peace be the last one of a great number or prayers. "That seems to indicate that in the Jewish conception, peace is not the superior principle, but rather the goal of our aspirations and efforts, their finality." Greek Orthodox Bishop Makarios de Lampsaque expressed sadness that the New Year started with new armed conflicts, but he said people should not be discouraged by then and he urged efforts to solve crises and "to convey respect and hope." The responsible monk from the Geneva International Buddhist Center in Geneva Dr. Bhante Dhammika and Geneva Protestant Moderator, Pastor Albert-Luc de Haller, also spoke. The Roman Catholic Church is not a member of the WCC. It however cooperates with the council on many issues, serving on its faith and order body as well as collaborating on many levels with WCC partners such as the ACT Alliance that deals with disasters and development.